Tormek Sharpening System Hand Tool Bundle TBH801 T-8. A Complete Water Cooled Sharpener with Hand Tool Sharpening Jigs. The best just got better. The Tormek T-8 is our top of the line water-cooled sharpening system, and is – by far – the best sharpening system one can buy. If you use tools that need a finely honed, razor-sharp edge, this machine will give you a lifetime of excellent service, and ensure your tools have an edge that allows you to effortlessly work your magic. It sharpens all manner of tools – knives, scissors, wood chisels, plane irons, spoke shaves, carving tools, lathe turning tools, Axes, and much more. If it has an edge, the Tormek T-8 will sharpen it. The Tormek Grindstone is constructed so that with the Stone Grader it can be treated to change its property from 220 grit to 1,000 grit. This has obvious advantages. You can make both the first fast grinding and the sharpening on the same grindstone and the same grinding machine and with the same jig setting. It’s designed to run at a continuous use 90 rpm speed, and the advanced SG-250 10”x2” wheel sharpens your tools without overheating them (no “blue” look on them). This speed and design also means it removes less metal to give it a sharp edge, which prolongs the life of your tool as well. If you want the best water cooled sharpener, the T-8 has no peer. 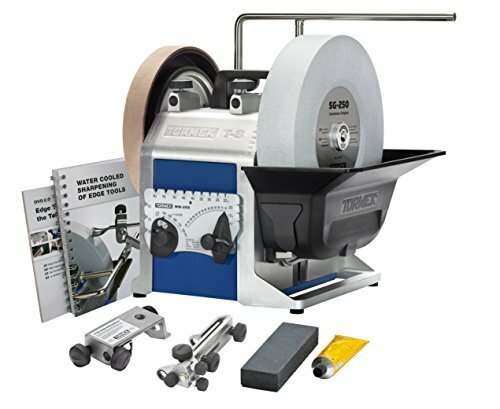 Included with this kit are the following: The sharpener, the above-mentioned grinding wheel, an 8-3/4" x 1-1/4" genuine leather honing wheel, Angle Master, Honing Compound, Stone Grader, Diamond Truing Tool, Advanced Square Edge Jig, Handbook and Instructional DVD. The included Hand Tool Kit includes the Knife Jig, Small Knife Holder, Long Knife Jig, Scissors Jig, Axe Sharpening Jig and Short Tool Jig. All packaged neatly together, this awesome system comes with a seven-year warranty. Hands down (pun intended!) this is the top hand tool sharpening system you can buy. LOTS OF EXTRAS, INCLUDING A SEVEN YEAR FACTORY WARRANTEE - Comes with an angle master, honing compound, diamond truing tool, and more. It's a sharpening shop in a box! View More In Sanders & Grinders.